By Stephen Russell. Simple and Advanced Techniques for Growing Mushrooms at Home. 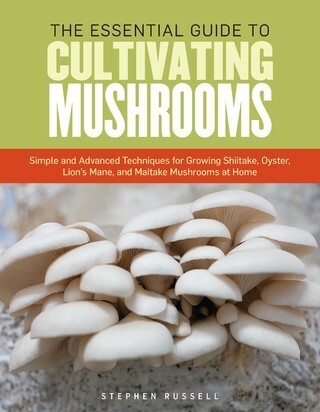 Cultivating Mushrooms is a book with with clear instructions and step-by-step photographs, this comprehensive guide shows you how to cultivate mushrooms in your own home, producing shiitakes, oysters, lion’s manes, maitakes, and portabellas for your kitchen or for a small business. Beginners will learn the best way to use a mushroom kit, as well as how to maintain the sterile procedures and controlled environment that cultivation requires. Novices and the more experienced will learn how to create grain spawn or sawdust spawn and how to use liquid cultures and fruiting chambers. Advanced readers will gain a thorough knowledge of how to work with large-scale grain spawn, agar, bag cultures, bulk substrates, and large fruiting chambers to produce mushrooms consistently and in greater quantity.